There are perhaps thousands of anti-snoring products that are currently on the market, some of which are downright bizarre. Throughout the years, the snoring mouthpiece and chinstrap have remained two of the most popular over the counter snoring solutions, each being sold by a number of different manufacturers. The snoring mouthpiece stops snoring by holding the jaw forward which clears the airway while a snoring chinstrap holds the jaw closed but does not necessarily exert much pressure to prevent the jaw falling back into the airway which can cause a blockage. While chinstraps are useful in some circumstances, they are not nearly as effective as some of the other stops snoring products that are being sold. Snoring mouthpieces have been around since the mid-1990’s and have grown in popularity ever since. New mouthpieces enter the market every year, some innovative while others are simply another spin-off of products from the past. In recent years we have seen advancements in mandibular advancement splints. We have even seen a completely new design emerge, classified as a tongue stabilizing device which works by holding the tongue forward instead of the jaw. While technology has advanced, one common complaint often expressed is the issue of keeping a mouthpiece in throughout the night. In fact, having a mouthpiece fall out during the night is one of the most common complaints that is often expressed. Some mouthguards, such as the SleepTight have made an extra effort to design their product so that it would remain in the mouth throughout the night, however, the majority of devices all seem to share the same flaw. The solution to address this issue may be easier than you think. While not exactly it’s intended use, some mouthpiece users have found that a chinstrap can serve as a useful tool when it comes to holding a mouthpiece in. The reason why snoring mouthpieces tend to fall out is that they often do not fit tightly and as we sleep, the jaw drops. When the jaw drops, this provides the perfect opportunity for a mouthpiece to fall out. The solution is to prevent fallout by holding the jaw closed with the mouthpiece inserted. Exactly how is this accomplished? If you guessed with a chinstrap, you would be correct. Due to the elastic nature of neoprene material that is used in most chinstraps, these headbands have taken on an entirely new purpose which is to help hold a mouthpiece in. The key is to choose two products that work well together. When choosing a mouthpiece, it is very important to select one that has holes at the front which will allow for proper breathing. Most of the mouthpieces today offer a breathing hole feature, although not all products are created equally. Some have larger holes while others are smaller which can cause a restricted airflow. The best rule of thumb is to select a mouthpiece that has a large breathing hole that will allow for adequate airflow. You will also want to consider the overall design of the mouthpiece which should fit snugly against the teeth when molded. Other considerations should be whether a product is FDA approved, the material that is made from, and the warranty that comes with it. Selecting a chin strap is much easier simply because there are not so many considerations. The chin strap should be soft and flexible as well as large enough to comfortably fit around your head. The better-designed chin straps will wrap around your chin and then connect to the back of your head with holes cut out for the ears. After choosing a chinstrap and mouthpiece combo that’s a good fit for you, give the mouthpiece a try by itself to see how often it falls out while asleep. Afterwards, you can try using the two together. You will likely notice that using the two together works well. Which Mouthpieces Require a Chinstrap? Generally speaking, most OTC mouthguards can benefit from the use of a chinstrap. This is especially true for products such as the zQuiet and the VitalSleep. The reason being is that they do not fit very tightly which makes them more likely to fall out while asleep. This is also true for a number of other mouthpieces. The easiest way to decide is to use the mouthpiece for a few nights. If you are waking up with it next to your pillow, using a chinstrap to keep it in may be a good idea. If falling out is not an issue, there is, of course, no need to wear a chinstrap. 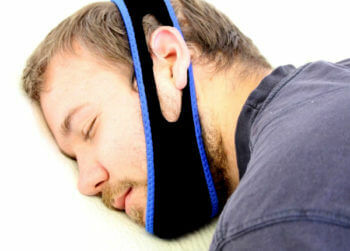 Will A Chinstrap By Itself Stop Snoring? You might be wondering if it’s possible to completely forgo the mouthpiece all together and just use a chinstrap. Is this even a possibility? 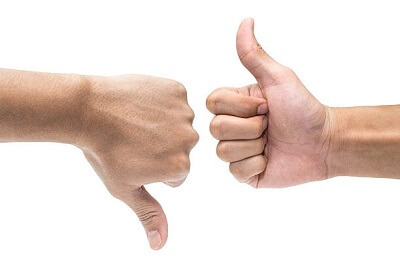 While there’s certainly no shortage of chinstraps on the market that claims to put an end to your snoring, in my experience, they do not seem to deliver as promised when used as a standalone unit. The reason behind this has to do with the mechanics behind the chinstrap. Simply stated, the positioning along with the elastic nature of the chinstrap actually supports the jaw by holding it up, but it does not help by preventing the jaw from falling back and closing off the airway. This function is best served by a boil and bite style mouthguard which actually keep the jaw forward and in place. Once in place, a chinstrap will help by preventing the mouth from opening while sound asleep. In addition to holding the mouth closed and preventing oral appliances from falling out, a chinstrap can also be used to hold the mouth closed in order to make CPAP nasal pillows more effective. A common complaint among CPAP users is that their mouth opens while using a nasal pillow which can dramatically decrease efficiency and cause dry mouth. The solution is to hold the jaw closed in order to prevent air from escaping. The elastic nature of the chinstrap acts as a giant rubber band that is used secure the jaw closed. The chinstrap can be used with a variety of different equipment, so take a close look at the design to determine if it’s going to work well with the equipment that you currently use. Some chinstraps are specially designed to accommodate CPAP users. The combination of a mouthpiece along with a chinstrap is a little-known secret that can be used by anyone who is experiencing difficulty keeping their mouthpiece in at night. If you are considering a mouthpiece and have concerns about it falling out or already own one and could use a little help keeping it in, a chinstrap is an excellent solution. There’s a large variety of different chinstraps to choose from and they come in many different colors. As for cost, they are fairly inexpensive. One can be purchased on average at a cost of around $20. Philips Respironics makes one that is quite popular. If you haven’t already purchased a mouthpiece, they can be found in combo packs which include both items in one package. Alternatively, you can search for a mouthguard that fits tightly, which will help to prevent fall out from occurring. Next post: Do Anti Snoring Pillows Work? Previous post: Nitetronic GoodNite Anti-Snoring Pillow Product Review – Can An Inflatable Smart Pillow Really Prevent Snoring?